We thought it would be fun to show pictures from clients who have "FOUND" a home for their treasures they have purchased from us- It is so fun to see where they end up and the creative ideas have! 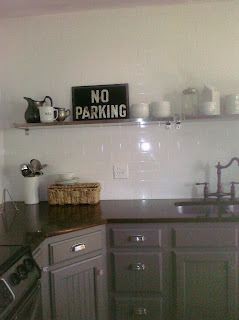 Sarah sent us this picture of her NO PARKING sign she bought from us- Thanks Sarah! We just sent home a 24 drawer chest today which is going to be the inspiration for a new craft room- can't wait to see that picture! Have a FOUND treasure you want to share? We would love to post it so everyone can see! Comin in tomorrow night for wine and design!! Got to get that couch ordered!! Love love love the new store girlie!! Love that kitchen! What is the counter top materiel? The countertops are coffee bean Silestone. I have been very happy with them!! !